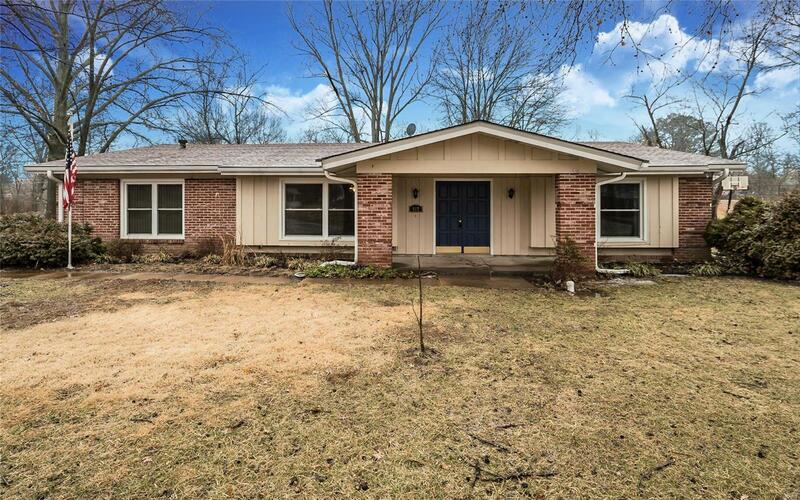 This main level living, 2 bedroom ranch home is located on a quiet street right across from Parkway West High and is near parks and restaurants! The master bedroom has been converted to a master suite with a walk in closet and extra space for a den. The bonus room can be used as an extra bedroom if needed, both bathrooms have been recently renovated, the kitchen is spacious and has a beautiful view to the backyard. The living room and dining room offer a great gathering space along with the family room with a fireplace for cool evenings. The extra 2 car oversized garage can be used as an extra car space or workshop in addition to the attached 2 car rear garage. Home needs a little TLC but will make a great space for someone needing everything on one level. Copyright 2019, Mid America Regional Information Systems, Inc.(MARIS). All rights reserved. Assist2Sell Advantage does not display the entire IDX database of Mid America Regional Information Systems, Inc. (MARIS MLS) on this web site. Property listings of some REALTOR® brokerage firms have been excluded. Listings displaying the MARIS logo are courtesy of the participants of Mid America Regional Information Systems Internet Data Exchange. Information provided deemed to be reliable but is not guaranteed to be accurate. Buyers are advised to verify all facts before making a decision on purchasing a property. No warranties, expressed or implied, are provided for the data herein, or for their use or interpretation by the user. Mid America Regional information Systems, Inc. (MARIS) will not be held responsibility for the content of such records. Last Updated On: 2019-04-23.